Sorry about the hiatus, guys. If you couldn’t tell already from my Picture of the Day posts – we’ve moved! This past week has been full of not-cooking as my new kitchen has slowly taken shape. I’m finally back in business – and not a minute too soon. This lunch was the first thing I actually made in the new place, and it came together quick. Just the ticket for a healthy and vegetable-packed lunch. Those of you that have been reading for awhile might recognize my favorite salad ingredient, broccoli slaw. I think I have an obsession issue with the stuff. I hate soggy lettuce with a passion, and home made salads always seem to disappoint – unless I use broccoli slaw. Then all is well with the world. I can’t get enough. Chop your veggies and add to a big bowl. 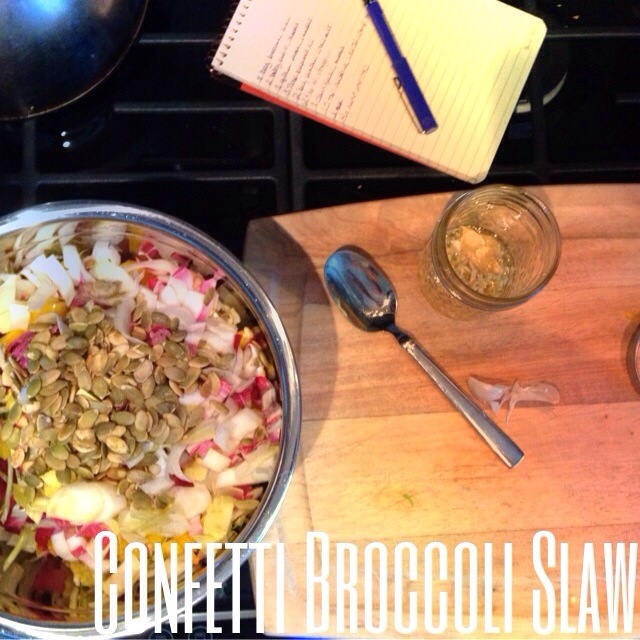 In a small bowl or mason jar, combine the dressing ingredients & shake/whisk. Combine the dressing with the salad and toss. Alternate seasonings: For lunch the next day, I decided to go a more curry route and added half a chopped apple and curry chicken to the salad mix plus 1 tsp. curry powder and 1 tsp. cumin powder to the dressing. Yum.